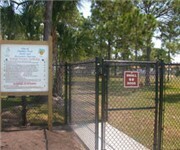 Freedom Lake Dog Park is located in the City of Pinellas Park. This Park occupies a 40-acre site developed primarily for passive recreation. How Would You Rate Freedom Lake Dog Park?